A progressive rush drill today. This one will work defensemen on regroup/quick counter situations, as well as playing half ice 2v1 rushes. To start the drill, one forward skates up to just before the red line and passes to a D standing inside the blue. The D does an escape and then passes to the forward who has stretched for a 1v0 breakaway. After the escape, two forwards take off and pass a puck to the D who does another escape and then hits the two forwards who attack a D who steps in 2v1. A new D then takes his place and the drill starts again. 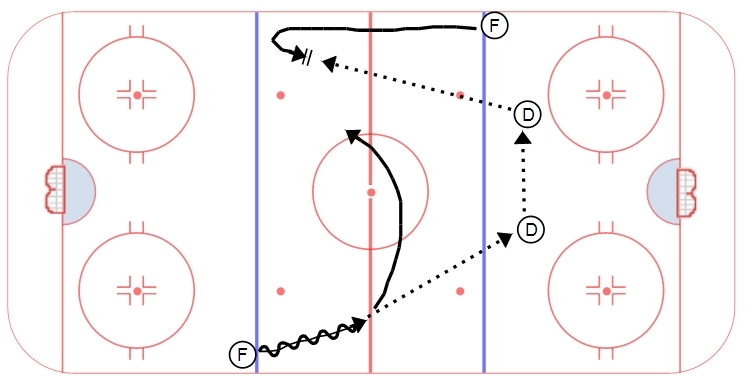 This drill can be run on 2/3rds of the ice or run from alternating ends. One of the benefits of this drill is it can be a situational rush drill (you can easily make it a 3v1 or a 3v2) and it is a good drill to run if you have a goalie coach who is working with the goaltenders in one end of the ice. 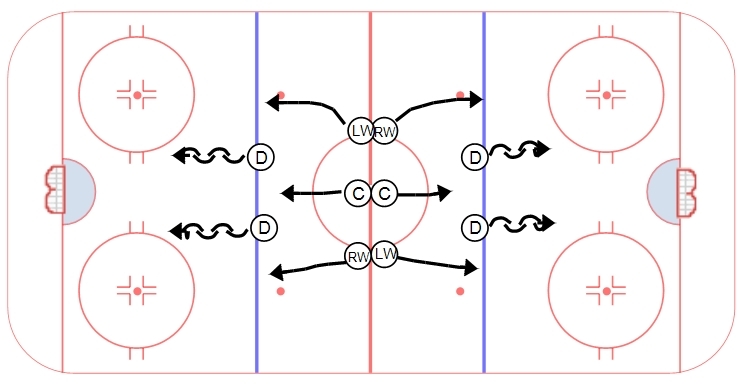 This drill focuses on rush offense and systemic play in the neutral zone. The drill starts with two lines of forwards and two sets of D. On a whistle, the forwards attack the D 3v2 from a standstill. The forwards must create an offensive chance – put pressure on the defensemen, put them in a vulnerable position; concepts such as middle drive, rink width, far pad shots, etc. After the rush ends, a whistle is blown and a second puck is presented in the neutral zone. The forwards are attacking the same net they attacked off the rush, the D are attacking the opposite net they defended. The objective with the second puck is to simulate a neutral zone situation, with both sides working on team systems in the neutral zone. The second puck can be placed or added anywhere, creating a quick counterattack/backchecking situation, a regroup, a hinge, etc. After the neutral zone situation, the drill resets and starts again. A simple post and go shooting drill for this week. 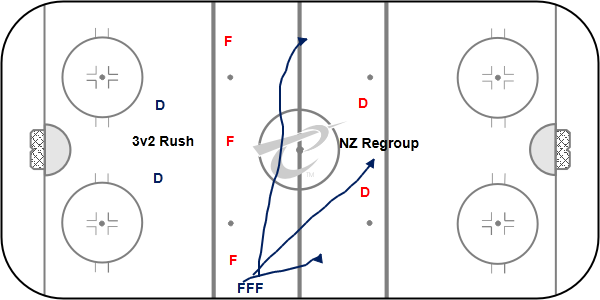 Forwards start at the blue lines, opposite ends go at the same time. One forward leaves with a puck, skates to the red line and passes it to a defenseman. Puck moves D to D, while the opposite forward posts up at the far blue line. After the D to D pass, a quick hitter is made to the posted forward who then passes it to the supporting forward and they attack the net 2v0. The drill then starts again from the other direction. While the drill itself is simple, there are some nuances that can be added and/or emphasized to increase the degree of difficulty and work on specific skills. For example, the D can do an escape upon receiving the first pass, and the pass up to the forward can be required to be direct or indirect. The forwards can be required to chip the puck or place a good area pass. 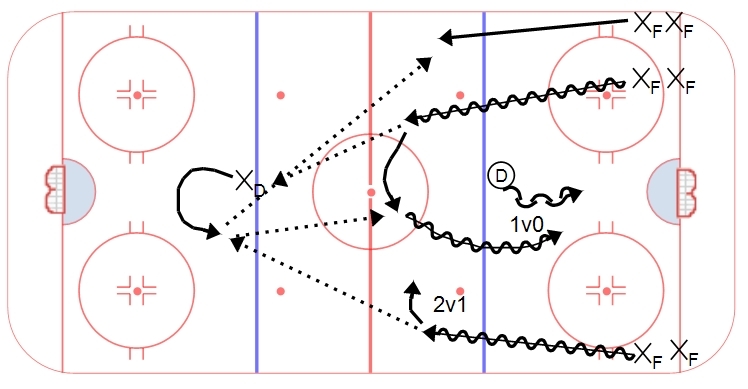 On the 2v0, the D can be required to follow the play up ice and the forwards can be required to utilize a 2v0 move such as a cross and drop, net drive/far pad shot, etc. The simplicity of the drill allows for players to focus on refining specific skill sets.